Fairy tales? Zzz. You’ve heard them all before. Princesses. Peas. Frogs. What’s more to say? 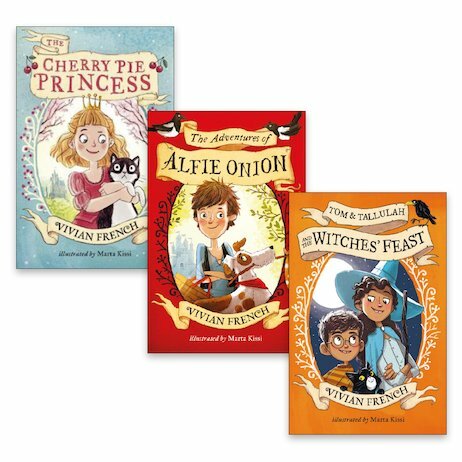 Well – when brilliant storyteller Vivian French steps up to write her own new tales, the answer is, quite a lot! (All with a scrumptious foodie twist, too.) Alfie Onion isn’t your typical hero. He’s not a prince, or rich or handsome. How can he make his mark? Princess Peony lives in a magical world of trolls, hags and giants. So why does she feel so sad – and what’s it got to do with cherry pie? Finally, Tallulah the witch is in a bit of a pickle. To save her bacon, she’s got to create a magical midnight feast. But how will she do it when no one will tell her what the menu is? Tuck in and enjoy!